5) Superman- This is an old classic from 1978, but it’s a good one. It’s the movie that jumpstarted this whole superhero genre, and is an incredible story about the first superhero America ever fell in love with. 4) Iron Man Trilogy- For the longest time the Marvel Cinematic Universe only produced flops. The curse lasted until 2008, in which they produced the first Iron Man movie. It stars Robert Downey Jr. as the lead having to face up to the weapons and villains he’s created over the years. They are very well done, and if you love action these are the perfect movies for you. 3) Captain America: the First Avenger- This movie will make you think it’s your constitutional duty to watch it. It’s beautifully well done, and allows you to see the origin of America’s favorite Avenger. 2) Batman: Dark Knight Trilogy- Batman sure has had his share of movies, but nothing is even a match for this incredible Christopher Nolan trilogy. It makes you see your favorite hero in a new darker, grittier way that makes the hero even more incredible. Christian Bales interpretation of Batman is incredible, and a must see if you’re in the superhero feel. 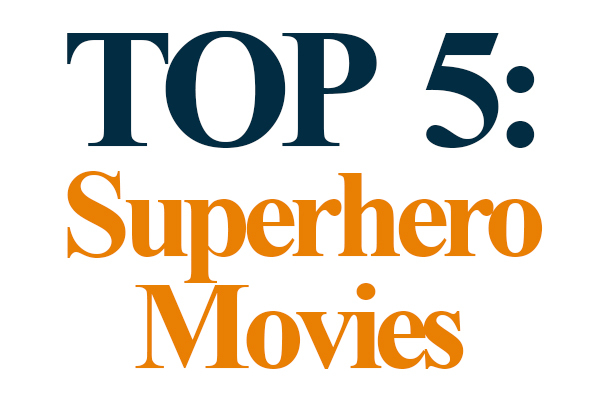 1) The Avengers- If you like superheroes this is the movie for you! This movie hits the mother-load because it doesn’t just have 1 superhero, it’s got a whole team of them! No superhero movies, besides the X-men, have included this major of a line up. Plus, the creators did it well enough to get a sequel.